How interesting to me on a busy day of 7 hours of teaching, that during the short break I have right now between classes, I would sit down at the computer and let my fingers take me where they will. I’ve looked at some old photos of my Laemmlen Grandparents’ home and Grandma’s funeral in 1988, then I wondered about my Smuin Grandparents and looked at their names for a minute, which led me to my 2nd and 3rd Smuin Great Grandparents’ names and photos, and then I happened on a mis-filed history of my 3rd Great Grandmother, Esther Hannah Pearce. I copied and saved that history into a place I will find it again with other Smuin histories, then attached it to her files in my database. As I was reading this 6-page history I found of her life, I thought, what an interesting story. I must write about her someday. It was then that I noticed that TODAY is the anniversary of her death in 1883. Is it odd that on this day, I’d happen across her words? I don’t think so. Things like this happen to me all the time as I am considering what to write about whom. It almost seems that on important anniversaries, those beloved ancestors hover near, wondering if they will be remembered here on earth. And if I listen closely and pay attention, they whisper to me or nudge me to notice them and say something about their lives so they won’t be forgotten. So this evening after teaching my last class, I will come home and write about Esther. I wish I had a photo of her when she was a young 19-year-old maiden (just Claire’s age) when she married Joseph Smuin in 1816 in Radley, England. At least I have a photo of her in her golden years. Tonight her story will follow. Now I must return to class to teach about writing personal histories. I’m back now to tell you about Esther. Born in a small rural village called Baulking, Esther grew up in a village of cottages and sheep pastures. In 1816 she married Joseph in Radley, a village a few miles away. Smuins had lived in Radley for at least 300 years prior to that (based on records from a local shoemaker’s shop). Esther and Joseph were poor, working odd jobs of all sorts to make ends meet. Joseph worked in the saw pit, peddled milk, and even braided and wove straw during the slow times. Esther contributed by making bobbin lace with other women in the community. They worked together in a group, but made their own individual work, with some complicated projects using up to 200 bobbins. During the winter, when the living areas were heated, the women worked bundled up in cold damp cellars with light reflected through clear glass jars filled with water. This was necessary so the humidity would keep the linen thread from becoming dry and brittle, causing it to break. Lace was graded and sold based on errors or knots in the work. Some projects took several months of steady work requiring miles of thread. Esther also worked sewing dresses, men’s suits, tailoring and doing embroidery work. In 1842, at age 48, Joseph was crossing the Thames at the Sandford Lock on his way home from work. He slipped and fell, striking his head on a boat passing under the bridge, knocking him unconscious. He drowned before help could reach him. Esther was left with 9 children to support. The older ones did what they could to help, working in the fields and on a dairy farm. 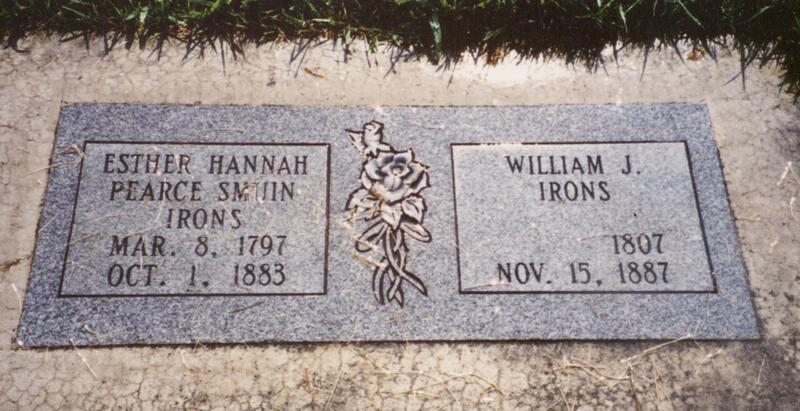 Three years later, Esther married William Irons, a widower with 2 sons. He was a shepherd who braided straw for hats. Esther’s family members learned this trade which helped support them for many years. Esther had a daughter named Susannah who had a son named George Smuin. They moved to London where they came in contact with LDS Missionaries. She and George joined with the Saints there. George loved to sing. As a 4-year-old he was able to memorize and sing the Hymns. The Missionaries would pick a busy street and place little George on a box and have him sing. When people stopped to listen, the Elders would preach to them. Susannah shared the truths she learned with her family members who embraced the restored doctrines. As they were able, members of the family left England to join the gathering of Saints in Utah. Esther was one of the last able to leave, and with the help of the Church’s Perpetual Immigration Fund, she arrived in Utah in the 1870s, settling in the Farmington-Kaysville area at the mouth of Shepard’s Canyon. Esther died on this day in 1883 in Ogden 130 years ago at the age of 86.